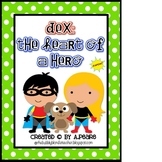 Dex: The Heart of a Hero is a great book to read to talk about building up stamina and working hard to accomplish a goal. After you read the book with your class, have your students use the words from the word bank to fill in the blanks and check comprehension. 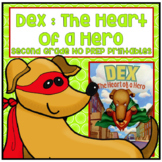 Journey's-Lesson 20-Dex: The Heart of a Hero-Test-2nd gr. 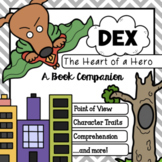 Test that covers comprehension, voc, and grammar. Only 2 pages compared to the LONG test that comes with the book. 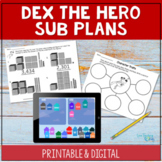 This pack includes many activities to go along with this unit. 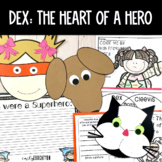 It includes spelling, vocabulary, comprehension, commas, reading groups, and a writing activity. 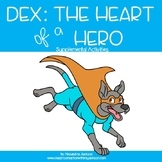 This is a pack of supplemental materials that you can use to go along with your Unit 4 Lesson 20 Journeys "Dex The Heart of a Hero." I use these activities I created for my students centers and extension activities. You can also use them in whole group and small group instruction. Preview included! 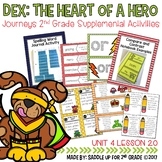 This is a copy of my lesson plans for Journey's Unit 4 Lesson 20 Dex: The Heart of a Hero including, whole group, small group, DI, and RTI.